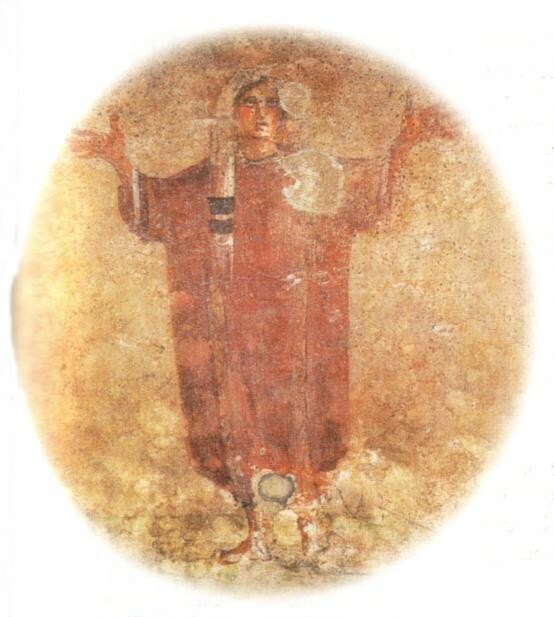 A fresco from the Catacombs of Priscilla in Rome depicting a female Christian preacher from around 230-240 C.E. Office Hours and Location: Mon. and Tues. 5:00–6:00 pm and other times by appointment, Vanier College 247. Class Time and Location: Tuesdays, 7–10 pm, DB 0004. 1. Course description: A study of the New Testament Gospels (Mark, Matthew, Luke, and John) and other early Christian texts from a historical and literary perspective. The course begins with a discussion of the first-century Palestinian context for traditions about Jesus and a look at scholars’ attempts to reconstruct the oral traditions that preceded Mark, Matthew, and Luke—known as the Synoptic Gospels. Each of these Gospels is then examined in turn with emphasis on the socio-historical background of the text and its interpretation and transformation of oral and literary sources. Theories on the literary relationships between the three Gospels will be discussed also. The Synoptic Gospels are considered historians’ best source for the life of Jesus. Therefore, the course will examine closely certain episodes from Jesus’ life as recorded in these Gospels, including the stories of his birth, death, and resurrection, and finish with a look at various scholarly reconstructions of the teachings and activities of the Historical Jesus. The Gospel of John will also be discussed, though scholars find little in its pages that sheds light on Jesus’ earthly life. Non-canonical texts and non-Christian texts will be brought into the discussions where they shed light on the canonical gospels. 2. Course Credit Exclusions: HUMA 2830 6.0; may be taken independently of HUMA 3421 3.0. Ehrman, Bart. The New Testament: A Historical Introduction to the Early Christian Writings. 6th ed. ; New York/Oxford: Oxford University Press, 2015 (earlier editions are permitted but students must ensure they are covering the appropriate materials for each class). Throckmorton Jr., Burton H. Gospel Parallels: A Comparison of the Synoptic Gospels. 5th ed. ; Nashville: Thomas Nelson, 1992. New Revised Standard Version, The New Oxford Annotated Bible with Apocrypha, College Edition. M. Coogan et al. (eds.). New York/Oxford: Oxford University Press, 2001 (another Bible is also acceptable but it must be the New Revised Standard Version). 4. Academic Integrity: York University is very concerned about the increase in student plagiarism. As heinous a crime as plagiarism is, sometimes it is perpetrated in ignorance. Please consult the SPARK page on academic integrity to learn more about it and about the repercussions of committing plagiarism (https://spark.library.yorku.ca/academic-integrity-what-is-academic-integrity/). All written work in this course is expected to be of high quality—i.e., it must conform to the style and format guidelines typical of Humanities courses—and it must be your own. To help ensure that these requirements are met, you are urged to consult the resources on SPARK. In addition, a style sheet of my own design is to be attached to your assignments (see the assignment descriptions below). No paper will be accepted without the style sheet attached. For additional writing assistance, visit the Writing Centre. NOTE: All graded work in this course is to be submitted to Turnitin.com (and brought to class in a hard copy). For an overview of this service and the University’s policies regarding Turnitin.com, please see HERE: It is very simple to use. Go to www.turnitin.com for instructions on how to create a user profile. You can use whatever email address you wish but it must be a working one since you will receive emails over the course of the year. It is recommended that you NOT use internet email accounts (e.g., Hotmail, Yahoo, etc.). You create your own password, so make it easy to remember. You will also require the following information to sign in initially: Class ID: 19964000. Password: newt. A. First-Century Judaism Quiz: Learning about biblical literature necessitates knowledge of the land and cultures in which it was written. To that end, study chapters 3 and 4 of Ehrman’s textbook, your own notes from the lecture on January 15, the maps on p. xxxiv–xxxv and 109 in preparation for a quiz that will take place in the first 15 minutes of class January 22. The quiz comprises two sections: a site map, and matching terms/names with descriptions. Be prepared to place the following locations on the blank map provided at the quiz: Alexandria, Antioch, Athens, Bethlehem, Caesarea, Caesarea Philippi, Cana, Capernaum, Cyrene, Damascus, the Dead Sea, Decapolis, Edessa, Ephesus, Gadara, Gerasa, Galilee, the Sea of Galilee, Jericho, Jerusalem, Judaea, the Jordan River, the Mediterranean Sea, Nazareth, the Nile River, Rome, Samaria, Sidon, Sinai, Tarsus, and Tyre (if you have trouble finding any of these locations, use other resources, including the maps in the Bible assigned for the course; do not ask the instructor). You may find it helpful to plot all of the locations on a single map, study this map, and then practice for the quiz by printing off blank copies and continually filling in the locations until you know them all. There is a practice map available HERE. Grade value: 10%. Each is worth 5% of your final grade (for a total of 25%). The tweets cannot exceed 280 characters! C. Analysis Assignments: For several classes you are asked to prepare for class answers to questions related to the assigned readings. The first of these (on the Gospel of Mark, due Jan. 29) is mandatory; you pick an additional two to complete from the remaining four (you can, and should, prepare for all four, but you can choose which two to hand in for credit). Your answers must be no more than two pages in length and should be brought to class to aid you in contributing to group work and class discussions. Each assignment will be graded out of 10. WARNING: the ideas presented in your assignments must be your own; any assignment which shows evidence of plagiarism will be given a grade of zero. No paper will be accepted without THIS essay format style sheet attached (find it HERE). Total Grade Value: 30%. D. Whose Historical Jesus? Just as the Gospels each present the evangelist’s own particular view of Jesus, modern studies of the historical Jesus also present a variety of interpretations of the Galilean holy man. Select one of the four books below and prepare a seven-page analysis that considers the following issues: what aspects of Jesus’ teachings and activities are emphasized? What are minimized? What is the scholar’s approach to the sources? (e.g., are certain texts used above others? How do they approach the solution to the Synoptic Problem? etc.). How much attention is paid to the Jewish context of Jesus’ life? To the roles of women in the Jesus movement? How does the scholar approach the supernatural aspects of the Jesus story? (i.e., miracles, virgin birth, resurrection). Reza Aslan. Zealot: The Life and Times of Jesus of Nazareth. Random House, 2014. Jane Schaberg. The Illegitimacy of Jesus: A Feminist Theological Interpretation of the Infancy Narratives. 1987. New edition Sheffield Phoenix Press, 2006. Bill O’Reilly and Martin Dugard. Killing Jesus: A History. Henry Holt & Co., 2013. Robert M. Price. Deconstructing Jesus. Prometheus Books, 2000. Students will present their assessment of the books in a group discussion session on April 2. A decision on which book to analyze must be made by February 5. Your paper will be accepted only if THIS required style sheet is attached (you can find it HERE). WARNING: start reading the book early, as it will be difficult to keep up with other assigned readings if you leave it too late. Required length: seven pages, plus a 300 word summary of your paper, emailed to me by midnight, Sunday March 31. This assignment must be submitted to turnitin.com by 7 pm. Due date: April 2. Grade Value: 25% (with 5% awarded to participation in the group discussion). E. Class participation: each class is divided between lecture material and discussion sessions. To ensure your participation in this group work, a portion of your final grade is allotted to evaluating your contributions to the group discussions. Value of final grade: 10%. Missing papers: In the event that papers go missing, it is your responsibility to keep a hard copy of all written work submitted for the course. Late papers: the instructor, like you, is a very busy person. He likes to receive papers on time so that he can give them back to you within a reasonable time and then get on with other things he has to do (the instructor has other courses to teach and other papers to grade). Late papers complicate his life. So, he cannot accept late papers unless they are accompanied with documentation from Special Needs or Health Services. Contact the instructor if you foresee problems handing in papers on time. Wednesday, January 16: Last date to enroll in Winter term courses without the permission of the instructor. Wednesday, January 30: Last date to enroll in Winter term courses with the permission of the instructor. Friday, March 8: Last date to drop Winter term courses without receiving a grade. Please come to class having read the assigned primary and secondary readings and having consulted the on-line resources. A lecture outline for each week’s class will be posted on-line by the Monday morning of each week. It is your responsibility to print your own copy of the outline and bring it to class. Read after class today: Ehrman, chs. 1-2. Online resources: the readings for today from the textbook discuss the process of assembling the modern New Testament from ancient Greek manuscripts. For additional insights into this process check out the Center for the Study of New Testament Manuscripts, whose goal is to digitize the world’s 5000+ Greek manuscripts of the New Testament. Read for today’s class: Ehrman, ch. 3-4. Read for today’s class: Ehrman, ch. 5-6. Online resources: Lawrence E. Frizzell of Seton Hall University has compiled this brief introduction to the various forms of criticism we will examine in today’s class. Read for today’s class: Ehrman, ch. 7; Gospel of Mark, Secret Gospel of Mark; 2 Kings 2–5 (Bible). Assignment: The vast majority of scholars believe Mark was the first gospel to have been written. Imagine you are living in the first-century and Mark is the only gospel text you know. Answer the following questions solely from information from the text: who is Jesus (where was he born? where did he live? what did he do?). Who are his most important followers and how are they portrayed? What is surprising about the end of the gospel, when the women go to the tomb to prepare Jesus’ body (for this last question see Mark 16:1–8; do not read 16:9–20 if it is included in your text)? Online resources: the Lumo Project is making word-for-word adaptations of the gospels. Their version of the Gospel of Mark (2017) is the first ever production of this gospel. Watch a trailer for it HERE. Read for today’s class: Ehrman, ch. 8; Q (PDF), Gospel of Thomas; start bringing Gospel Parallels to class. Online resources: The Oxford Hypothesis (one of several solutions to the “Synoptic Problem”) has found an outspoken defender in British scholar Mark Goodacre. He has constructed a web site that is a great resource not only for the study of the Synoptic Gospels, but for other biblical research also. Check out his response to the Two-Document Hypothesis at his NTGateway site. Read for today’s class: Ehrman, ch. 9; The Gospel of Matthew. Assignment: read the Confession at Caesarea Philippi (Gospel Parallels #122; p. 99–100). Assuming Mark wrote first, and Matthew used Mark as the source for his gospel, what changes did Matthew make to the story? What are the results of these changes (i.e., how does Matthew’s version read compared to Mark’s? What has Matthew done to change the story?). Online resources: Several years ago PBS produced a series called “From Jesus to Christ: The First Christians.” To accompany the series, PBS set up a web site with some useful articles and resources. You can visit the site at http://www.pbs.org/wgbh/pages/frontline/shows/religion/. Read for today’s class: Ehrman, ch. 10; The Gospel of Luke. Assignment: Luke offers us our second look at the birth story of Jesus. For this assignment I want you to read both Matthew’s and Luke’s infancy narratives (Gospel Parallels #A-L) and note the differences and similarities between the two accounts. Working as a historian (i.e., looking at sources and trying to determine from them what actually happened), what do you think we can say about Jesus’ early years based on these two accounts? How do we reconcile the differences between the two accounts? Is it even possible? Online resources: readers of Luke are surprised at the prominence of women in the gospel. One of the most exciting areas of research in the New Testament is the topic of women in Early Christianity. For a recent discussion of the topic visit http://www.pbs.org/wgbh/pages/frontline/shows/religion/first/women.html. For today’s class: Today we will look at several key pericopae (episodes) from the Synoptic Gospels. Be sure to bring your copy of Throckmorton’s Synopsis to class. Assignment: the Gospel of John has been labeled the most anti-Semitic of the NT gospels. Do you think this is true? Is the Gospel of John anti-Semitic? Be sure to note in your answer which particular material from the gospel could be considered anti-Semitic. Online resources: Part of our discussion today will focus on the identity of the enigmatically named “Beloved Disciple.” For an introduction to the issue of the gospel author’s identity, read this Wikipedia article. Assignment: select one of the primary texts assigned for today’s class and describe the following: what is unique about this gospel’s view of Jesus and/or other characters found in other texts we have read in the course? Why do you think the writer chose to write this text? Read for today’s class: Ehrman, chs. 15-19. Online resources: Richard Carrier is a prominent proponent of the view that Jesus did not exist. He has a large presence on the internet, including several long videos of his lectures. This relatively short one (about an hour) will give you a sense of how he arrived at his position.